Paul McCartney's "Unforgettable" Christmas Album Resurfaces on YouTube . Beatles Radio: The Beatles, Solos, Covers, Birthdays, News The Fab 4 and More! Paul McCartney's long-lost Christmas album Unforgettable has been posted on YouTube more than 50 years after it was created. 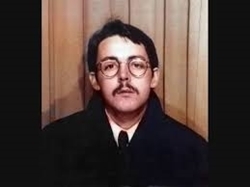 Simon Wells, a Beatles fan who shared the video online, said McCartney made the album as a Christmas gift in 1965 for his bandmates John Lennon, George Harrison, and Ringo Starr. According to the Huffington Post, only three additional copies were made in addition to McCartney's original, which he created in his home. Per Mark Unterberger's book, The Unreleased Beatles: Music and Film, McCartney told Mark Lewisohn in 1995 how the album came about. "I had two Brenell tape recorders set up at home, on which I made experimental recordings and tape loops, like the ones in 'Tomorrow Never Knows,'" McCartney said. "And once I put together something crazy, something left-field, just for the other Beatles, a fun thing which they could play late in the evening. It was just something for the mates, basically." The album features McCartney playing the role of a DJ as he introduces a playlist of various songs. There is no new content on the album from The Beatles or McCartney, but it features hits from The Rolling Stones, Elvis, and Nat King Cole, who sings the title track. While there is no word on how Wells got a copy of the album, McCartney told Lewisohn that he always believed there was a copy out there. "Unfortunately, the quality of these discs was such that they wore out as you played them for a couple of weeks. There's probably a tape somewhere, though," McCartney said.